Aberdeen-born Peter Strachan was educated at Kirkcudbright Academy and Durham University, joining the railways 34 years ago as a British Rail management trainee. A life-long railman, he has held a string of senior roles, including running a train operating company and a major section of Network Rail. He joins Serco Caledonian Sleeper from Serco’s business in Australia where he led on and supported two key rail bids in Sydney. Prior to joining Serco in 2013, Peter was Director-General Major Projects for the Department for Transport, leading on the UK Government’s major rail and road capital projects and for transport in London, including the London 2012 Olympics and chairing the CrossRail joint sponsor board. 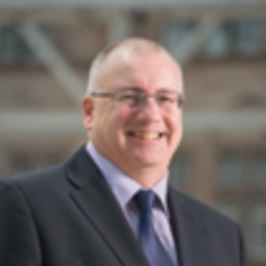 Also in the UK, Peter has successfully led a number of UK train operating companies as Managing Director, including Arriva Trains Wales and was Route Director for Network Rail London North Western. Overseas, Peter was CEO of National Express Group’s Rail Division in Melbourne and latterly CEO for TransLink Transit Authority in Brisbane.